Sgt Capes of Cambridgeshire Police presenting a report on youth antisocial behaviour in Melbourn. On the evening of the 17th of April 2012 I attended the Bassingbourne and Melbourn Neighbourhood panel meeting, at which the local police priorities for the upcoming couple of months were set. The panel meeting was not run democratically, the priorities were set unilaterally by member of police staff John Fuller after the meeting had received reports from the police and those present had an opportunity to raise points. Lobbying to Keep Democratically Set Police Priorities in Cambridge. Mob Sets Sawston Police Priorities. Residents complained about the sale of energy drinks, such as Red Bull, and caffeinated drinks, to “underage” youths in Melbourn. Residents and the police sergeant present said this was illegal. Tackling the problem was set as a priority. The only county councillor present, Liberal Democrat County Councillor Cllr Van de Ven, opposed the energy drink priority, but was overruled by Mr Fuller. The meeting was told that the police had used restorative justice to require youths who had gathered on a green to pick up litter. Their “offence” was merely “gathering” in a group. The meeting covered an area including Haslingfield, Harston, Barrington, Shepreth, Foxton, Fowlmere, Melbourn, The Chishills, Litlington, Steeple Morden, Guiulden Morden, Kneesworth, Gamlingay, Little Gransden and Longstowe. The farcical nature of proceedings started before the meeting got underway. South Cambridgeshire District Council listed the meeting on its website, but with no location (the relevant officer was informed). Neither the council nor the police had published the police report to the meeting in advance. Residents from the area complained there had been no ecops email messages for a while (so presumably it wasn’t advertised there). The website http://melbourncambridge.co.uk (apparently an independent commercial hyperlocal website) listed the date of the meeting along with some previous minutes, but the latest are from July 2011 whereas the panel last met in January 2012. There were no signs directing people to the meeting in or outside the building it was held in. I found it by following likely looking people, (the other actives in Melbourn Village College that evening were all sporting). The meeting was chaired by police staff member Mr John Fuller. Police officers Sergent Jon Capes and Inspector Chris Savage were also at the front of the room along with an officer introduced as “Linda” from South Cambridgeshire District Council. It was noted by the chair that Cambridgeshire County Council had failed to send an officer to attend the meeting. No one else was introduced. I spotted Liberal Democrat County Councillor for Melbourn Susan van de Ven (she said hello). The other County Councillors for the area, Sebastian Kindersley (Liberal Democrat, Gamlingay) and Linda Oliver (Conservative, Bassingbourn) were absent. I’m not sure about Cllr Jose Hales (Liberal Democrat, Melbourn) one of those present looked a bit like him, but that person called for the death penalty, and urged action against youths buying and drinking energy drinks, and at the end the police thanked him from moderating his contributions [implicitly not being as disruptive as previously]. If the guy at the back near the door left was a Liberal Democat councillor the party needs to review its vetting! Many of the others attending appeared to be parish councillors. In total there were eighteen people in the public seating, including me and the councillors. When the chair asked if anyone had no attended a panel meeting before it was revealed there were no newcomers to police priority setting. The chair started by listing villages and parishes asking if there was anyone either from, or representing, each area. Fowlmere was the only area for which there was no response, but Cllr Van de Ven indicating her presence was the lone representation for many places listed. Dangerous dogs in Litlington was the first item raised, six dogs running loose were reported. This was clearly an long term ongoing issue, the person raising it said someone living opposite a property where their were six dogs had sold up and moved – partially due to the dogs and asked if a child would need to be bitten by a dog before action was taken. The police noted the matter was still a problem, they appeared to think it had been resolved. An eight year old issue relating to planning and parking restrictions in the vicinity of Fieldgate nurseries, Meldreth, was raised and noted to be still ongoing. Mr Fuller apologised for the lack of content in the report. He said that the staff responsible were being centralised within the police and this had prevented the usual data from being made available. 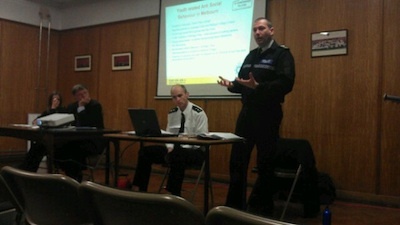 Police Sergeant Jon Capes reported on the work done tackling a previous priority of “Anti Social Behaviour in Melbourn”. Cllr Val Barrett said that a resident was pouring bleach in a doorway because people were urinating in it. The police noted this point, but said that overall they didn’t think there was a particular problem with anti-social behaviour in Melbourn and asked for it to be dropped as a priority, leaving any emerging issues to be dealt with as “business as usual”. Cllr Van de Ven said she was still getting reports from residents about youths gathering. The police noted that some in Melboun were “sensitive” to antisocial behaviour, and related that they were getting calls from residents over exaggerating what was going on in an effort to make the police attend. (It sounds to me as if consideration ought be given to prosecuting these people for making malicious calls, or at least speaking to them and making clear youths gathering is not a crime). The police reported that on occasion they came across a group of young adults drinking together, but took no action because nothing illegal was going on. They said that if anyone under eighteen was found drinking they would write to their parents, (under their “Guardian Awareness programme”) but suggested this was very rare. The meeting then took a bizarre turn. A resident called for action against shops selling energy drinks to children. He asked the police to ensure shop owners, and their staff were aware they were an age restricted product. Other members of the public quickly jumped in, saying they wanted action taken to curb the supply not just of energy drinks but brown caffinated ones too. A number of members of the public insisted the sale of these products to children was illegal. One said children were: “running around like headless chickens on Red Bull”. Cllr Van de Ven and those sitting between her and me started whispering saying they weren’t aware these products were age restricted. Mr Fuller and Sgt Capes appeared very keen to act and appeared convinced there was some criminality to address. A member of the public reported a scooter being driving on the pavements of Foxton; he said he didn’t think the rider understood what they were doing was wrong. A proposed redesign for Bassingbourn high street was mentioned. When one member of the public mentioned a speeding problem in their village they were heckled by another member of the public and the suggestion made they should take part in the police’s “speedwatch” scheme (volunteers using speed guns) as that made the police take an interest in a village. The police confirmed this, Sgt Capes said those villages where there were Speedwatch groups got more police attention. A parish councillor was among those saying that speeding was the top problem in the area, and there was increasing disillusionment with the effectiveness of speedwatch. He said his parish council had money they would like to spend addressing speeding, but wanted help to determine how it could most effectively be spent. The meeting was told that following the re-organisation Chief Inspector Darren Alderson was now the commander for South Cambridgeshire and had response police, CID and neighbourhood police under his command. It was noted that while some elements of policing were getting more local, with local accountability, others were going in the other direction as their provision was being shared with other forces, examples given by Inspector Savage were: firearms, murder investigations and child protection. Members of the public complained they’d had no Ecops messages. Inspector Savage said this was due to a move to “ECops2″, but Mr Fuller said the old system should still be being used. Public here think elected commissioners will be a waste of money. I wonder if they know @PACambs [Cambridgeshire Police Authority] costs £1m/yr (Clerk on ~100k/yr). The meeting was opened up for comments from the public. Cllr Van de Ven asked for crime data from British Transport Police to be included in the reports to the panel meetings. Mr Fuller said the individual in Cambridgeshire Police capable of obtaining the information from the transport police was no longer available. (Transport police data would be useful in East Cambridge, which covers Cambridge station too). A member of the public complained about driving on the pavement in Bassingbourne. Complaints were made by speedwatch volunteers saying they were not being supported enough by the police. The meeting was told that some people were speeding up when they saw speedwatch patrols. Mr Fuller on behalf of the police said the police would take reports of this seriously and urged the volunteers to pass the information on. Double yellow lines in Foxton and Meldreth were mentioned. Cllr Van de Ven reported a small length of these had been approved but would take months to get painted. Parties held at Shepreth lakes, with party goers urinating on gardens in Station Rd in the village were reported as being a problem a couple of times a year. The police inspector said that if this issue was raised it might prompt the interest of the licensing authorities, he said he was unaware of the venue. Scrap dealers in the area were working with the police and signing up to a service level agreement. No details of exactly what information is being shared was given. British Telecom have a system called “rabbit” which detects broken cables. This has allowed the police to disrupt cable theft attempts, people have fled leaving cable, but have not been caught. There have been cases of people putting white goods outside while cleaning or decorating and having them stolen. A member of the public asked for the death penalty for those caught stealing metal from war memorials. Mr Fuller, in the chair, said it was not appropriate to discuss sentencing, as that was a matter for judges. Inspector Savage however ignored the chair, he said the community could influence sentences via “community impact statements” and urged communities to work with their local officers to produce such statements, to be read out to the courts, when sentencing people for offences which have had an impact on the community. Someone asked if anyone was interested in small instances of fly tipping. South Cambridgeshire District Council said it was, and the police even said often flytipping interested them too as it was often related to other crime. Someone from Chishill reported the Bluebells were out in the village, and there were no crime or policing issues to report. Fuel thefts and garages being opened (looking for fuel?) in Abington Pigotts were mentioned. The supply of alcohol and energy drinks to young people in Melbourn. Speeding – doing more to support speedwatch volunteers. A burglary detective was also to be invited to a future panel meeting, as while burglary levels were not significantly increased, they are a form of crime in the area which has a significant effect on people. After hesitating for a while, and not really behaving like someone representing thousands of others, she finally spoke up and said she disagreed with the “energy drinks” element of the priority. Mr Fuller overruled her, despite him being unelected and her having the largest electoral mandate of anyone in the room. Inspector Savage gave an assurance he wouldn’t being going out “tomorrow” and taking action on energy drinks sellers and consumers; he promised to discuss it with licensing officers first and noted it was the first time he’d been asked to take action in the area. Mr Fuller noted S34 of the Police Reform and Social Responsibility Act 2011 required the police to hold such public meetings. He said he was leaving the police following their reorganisation, and the next meeting would be led by the police officers. He noted that the new law would ensure the meetings continued in some form, and said the police were considering what their format ought be. The date and location of the meeting, along with the police report ought to have been made easily available from the police and local council websites. I would like to see police priorities set democratically by councillors. I’d like to have seen more councillors attend the meeting, and for the councillors to be sitting at the front, with a councillor in the chair. Holding the police to account for their performance ought be a much more important part of the meeting, as should prioritisation, not simply raising issues. In the Melbourn and Bassingbourne areas I’d like to see the County and District councillors vote on the priorities. This being effective would require people to elect decent councillors who were interested in local policing and who would turn up to the meetings. I think empowering local councillors would encourage better local councillors and more interest in local democracy. I think the “energy drinks” priority is crazy. The police appear to have been duped by an urban myth, energy drinks are not age restricted products. (They have form). If there are problems in Melbourn they appear to be as much with those complaining as with the behaviour of youths. I think the police need to be more prepared to say “that isn’t a police matter” or similar when they are called to reports of gathering youths. People need confidence there will be a police presence and response when one is needed, often a lack of this confidence is behind calls to the police for gathering. I wonder if there is a lack of engagement between those of different ages in Melbourn and if that might be the underlying issue which needs addressing. I’m 31 and appeared to be one of the youngest people at the Melbourn police priority setting meeting; the majority of attendees appeared twice, or more my age. I am concerned by the keenness of those at the meeting to criminalise young people who are doing nothing illegal. I am particularly concerned about the abuse of “restorative justice” reported, gathering in groups is not a crime, and where there is no offence, there ought be no “restorative justice”. I think this case should be reviewed by the Police Authority and the force’s lead on restorative justice, if necessary apologies ought be made. I think it would be useful if an Elected Police Commissioner, or preferably someone acting sooner, worked with local councillors, including at parish level, to come up with lists of options, costings, and routes to rapid implementation of ways to make roads safer. Discussion at the meeting was exclusively on enforcement; this is expensive, unsustainable, and doesn’t have a lasting, ongoing effect. I would have thought local people would be best placed to know their local problems, but it appears parish councillors are looking up to the police, districts, and county for help. Different things are appropriate for different villages, in some cases where there are lots of cyclists and pedestrians using stretches of country roads perhaps we need to look into acquiring adjacent land, perhaps on the “other side” of hedgerows to put in paths; in others things like pinch points, “gates”, coloured roads, signs showing vehicle speeds or other measures might be appropriate. Those setting police priorities need to do so on the basis of the best available data (including what they’re hearing from constituents) . I’d have liked to see much more information on a wider range of crime, and other statistics. Perhaps statistical officers ought attend priority setting meetings, so they can interrogate crime reporting systems, traffic collision maps, as well as police, fire and ambulance call out data, live in an interactive manner in response to issues raised. Those setting priorities need to be aware of what options and technology are available; for example RADAR based unobtrusive speed monitoring. I’d like to see more quantified priorities being set. In relation to the areas raised at this meeting, perhaps reducing injuries in traffic accidents by a certain amount in certain areas would be appropriate, this could be a longer term target but with progress monitored at quarterly panels. It may be in some areas accidents aren’t the ultimate problem relating to speeding, but that speeding puts people off walking and cycling, so the target could be to get those rates up. I think it is excellent that the boundary between “response” and “neighbourhood” police is being broken down, and hope we’ll get a more locally accountable and consistent police force as a result. No member of Cambridgeshire Police Authority was present at the meeting. There was no mention of the roll-out of TASER to non-firearms officers which the chief constable has announced he will go ahead with irrespective of the views of the Police Authority. The date and location, but not time, of the next priority setting meeting was provided: Tuesday 17th July – Bassingbourn Village College. Melbourn Neighbourhood Policing Team webpage – warning due to police technical incompetence some thumbnail images are many megabytes in size! This entry was tagged Licencing, Melbourn, Police, Speeding, Traffic on April 18, 2012 by Richard Taylor. It’s not me who thinks Gamlingay was included in last night’s meeting, it’s the police, County Council, and South Cambridgeshire District Council too – the map of the area provided by the report from those bodies included Gamlingay. The Cambridgeshire Police page for Melbourn Neighbourhood Policing Team includes Gamlingay’s two PCSOs. Sorry – obviously I didn’t make myself explicitly clear. The Gamlingay Police Panel – which for administrative purposes belongs to the Melbourn Neighbourhood in the same way as South Cambridgeshire pertains to Cambridgeshire – is a separate Police Panel with representation from all the Gamlingay Division Parishes plus Harston & Hauxton. It meets quarterly alternating between Haslingfield VH and Gamlingay VC. I attend every meeting as does Cllr Liz Heazell, Cllr Janet Lockwood and Cllr Bridget Smith. In addition representatives from the Police, Police Authority (usually Jayne Wright, one of the Independent members), 15 Parish Councils, South Cambs DC and the County as well as interested Parishoners attend. The fact that there was no mention of nor representation from the Parishes of Arrington, Croydon, Hatley, Longstowe, Lt Gransden, Croydon, Gamlingay, Orwell, Wimpole, Barrington, Harlton, Haslingfield, the Eversdens, Hauxton and Harston might have tipped you off that all was not as you had assumed at the Melbourn Panel meeting? If your position is that you don’t believe this to be the case then do say so. If you wish the two Panels to be merged then say so (altho this will be very unpopular). But until then I hope you would agree that my fellow Councillors and I are better off attending the Gamlingay Panel to hear the issues and concerns of people who we represent rather than the Melbourn Panel which is nothing whatsoever to do with us and which has a fine raft of elected Councillors to look after their own issues. Hope that clarifies the position absolutely. BW. Is this the same Mr Fuller of whom you once wrote “Mr Fuller is a member of police staff who accompanies police officers to public meetings and stops and corrects them when they say excessively silly things”? In which case “saying excessively silly things” appears to be an infectious disease. I was disappomted with your downbeat and somewhat distorted view of the meeting (which I also attended. Knowing as I do (being in the Cambs NHW Group), how heavily hit the cambs Constabulary have been hit with a massive reduction in funding budget and the consequential downsizing that is having a marked impact at this time as the staff move into their new workplaces. The important point is that the Cambs Constabulary is ensuring it is keeping its eye on the ball during the changes, and the principal reason for having a police force, namely fighting crime and dealing with major incidents. Anything else can take 2nd priority for the monet until all the changes are in place. I can’t see how this can be seen as either downbeat or distorted. I was very unhappy with the tone of the meeting being in support of the criminalisation of innocent young people and of the lack of democracy, so I maybe “downbeat” could describe my feelings in-light of that; though personally I’d describe my feelings more in terms of invoking a passionate response and a desire to put a stop to it. The article above is positive and full of suggestions to improve things. Police priority setting meetings should hear from everyone, including often unelected parish councillors and neighbourhood watch representatives, but I think their role should be in putting suggestions to elected district and county councillors. (In some areas with thriving democratic town/parish councils the district and county councillors running meetings might want to give town/parish councillors a greater role and I think that decision ought be taken locally). If the implication intended by Vic Nickson’s comment is that local policing is something separate from “fighting crime” I disagree. I think good local policing, and a good relationship between the police and public is essential for the police to be able operate effectively. I wonder how many residents, or business owners, or others interested in the policing of Hastlingfield and Gamlingay consider themselves “parishioners”! If local County and District councillors want a separate panel for Hastlingfield and Gamlingay I think they’re the ones who should make that decision. I think there can a difference between ward based policing meetings and those which formally set priorities. Both can be useful, with the former allowing more detailed discussion of more localised matters. At the moment a key problem here is the lack of clarity and information being provided about the police priority setting process in this area. The police webpage for Bassingbourne and Melbourn makes no mention of the separate panel for the north of the area.